Sisters Imelda Crew and Paula Buckley had been enjoying a holiday in Kerry. The scene at Inch Strand yesterday evening. IT HAS BEEN confirmed that the two women who died after getting into difficulty while swimming at a beach in Kerry were nuns who were there for a holiday. 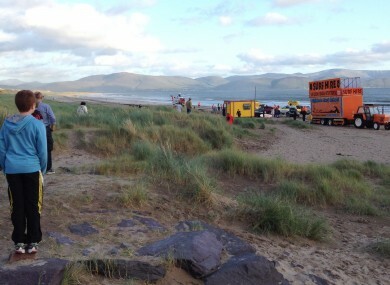 The woman, named as Sisters Imelda Carew and Paula Buckley, were taken out of the water yesterday evening at Inch Strand. They were airlifted to Kerry General Hospital where they later died. Today, the Union of Presentation Sisters said the two elderly women had been on holiday in Kerry. We are all stunned and shocked by this tragedy. Words seem inadequate to express our loss and sorrow as we come to terms with the tragic events that unfolded on a beautiful sunny evening. It is a tragic loss for all of us and for their families. These two wonderful women have been a source of inspiration and blessing to many people throughout their lives. Our thoughts and prayers are with the families, communities and friends of our beloved Sisters at this time. TD Mattie McGrath also expressed his sympathy for the women’s families and community. Email “'Wonderful women': Tributes to nuns who died in Kerry swimming accident”. Feedback on “'Wonderful women': Tributes to nuns who died in Kerry swimming accident”.